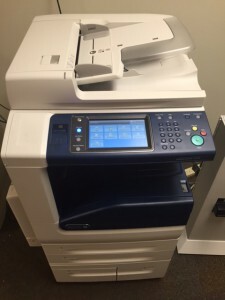 One coin operated paper copy machine available for use when Digiprint Center is closed. Located near room 115. Faxing Service: See Digiprint Center for details. Location: DoIT computers, First floor, North End. There is no charge to use these machines. You may scan to scan to your USB drive or send a copy to your email address. Paper copies cost $0.10/page. Black and white scanner/copier with document feed. Photocopiers and scanners available. Bring a USB drive. No photocopying, but a scanner is available. Bring a USB drive. College of Veterinary Medicine affiliates: contact library staff regarding copy codes.